One The Trial of "Experience"
"'Experience', of all the words in the philosophic vocabulary is the most difficult to manage;" warns Michael Oakeshott, "and it must be the ambition of every writer reckless enough to use the word to escape the ambiguities it contains. "1 Such an ambition, however, may be more typical of philosophers anxious to still the play of language and come to firm conclusions about what it purports to represent than of intellectual historians interested in the ambiguities themselves. Typically, the former employ one of two methods to reduce or eliminate polysemic uncertainty: either they legislate a privileged meaning and banish others to the margins (Oakeshott himself follows this model, explicitly stating that "I will begin, then, by indicating what I take it to denote"2), or they seek a ground of authenticity in the word's putatively "original" meaning. Such attempts to "manage" a word, in Oakeshott's telltale metaphor, are especially dangerous when it comes to "experience." For they impose a rigid and atemporal singularity on precisely what should be acknowledged as having had a varied and changing development—on what might provisionally be itself called a semantic experience. While admitting some limits to the infinite flexibility of any term, it would be unwise to decide in advance that certain meanings are proper and others not. The lessons of Ludwig Wittgenstein's stress on meaning as use and deconstruction's tolerance of catachresis suggest that when a word has had as long and complex a history as "experience," no justice can be done to its adventures by premature semantic closure. The English word is understood to be derived most directly from the Latin experientia, which denoted "trial, proof, or experiment." The French expérience and Italian esperienza still can signify a scientific experiment (when in the indefinite form). Insofar as "to try" (expereri) contains the same root as periculum, or "danger," there is also a covert association between experience and peril, which suggests that it comes from having survived risks and learned something from the encounter (ex meaning a coming forth from). Perhaps for this reason, it can also connote a worldliness that has left innocence behind by facing and surmounting the dangers and challenges that life may present. The Greek antecedent to the Latin is empeiria, which also serves as the root for the English word "empirical." One of the Greek schools of medicine, which drew on observation rather than authority or theory, had, in fact, been called the Empiriki and was opposed to the competing factions known as the Dogmatiki and the Methodiki. Here a crucial link between experience and raw, unreflected sensation or unmediated observation (as opposed to reason, theory, or speculation) is already evident. So too is the association between experience as dealing more with specific than general matters, with particulars rather than universals. As such, it contributes to the belief, which we will encounter in certain usages, that experiences are personal and incommunicable, rather than collective and exchangeable. Another Greek word, pathos, is sometimes included among the antecedents to the modern concept, even if the etymological link is absent. It basically means "something that happens" in the sense of what one suffers or endures. When experience suggests an experiment, its more active or practical dimensions are activated, but when it is linked to pathos, its passive moment— the acknowledgment that experiences can befall one without being sought or desired—comes to the fore. Here patience can become a virtue, and waiting for an encounter that one cannot force is understood as a source of experience. In German, the equivalents of "experience" merit special attention and in fact have been widely remarked in the general literature on the subject outside of Germany. Erlebnis and Erfahrung are both translated by the one English word, but have come to imply very different notions of experience. In the writings of certain theorists keen on exploiting the distinction, such as Wilhelm Dilthey, Martin Buber, and Walter Benjamin, one is often contrasted invidiously with the other (although, as we will see, not always with the same definition or evaluation). Erlebnis contains within it the root for life (Leben) and is sometimes translated as "lived experience." Although erleben is a transitive verb and implies an experience of something, Erlebnis is often taken to imply a primitive unity prior to any differentiation or objectification. Normally located in the "everyday world" (the Lebenswelt) of commonplace, untheorized practices, it can also suggest an intense and vital rupture in the fabric of quotidian routine. Although Leben can suggest the entirety of a life, Erlebnis generally connotes a more immediate, pre-reflective, and personal variant of experience than Erfahrung. The latter is sometimes associated with outer, sense impressions or with cognitive judgments about them (especially in the tradition associated with Immanuel Kant). But it also came to mean a more temporally elongated notion of experience based on a learning process, an integration of discrete moments of experience into a narrative whole or an adventure. This latter view, which is sometimes called a dialectical notion of experience, connotes a progressive, if not always smooth, movement over time, which is implied by the Fahrt (journey) embedded in Erfahrung and the linkage with the German word for danger (Gefahr). As such, it activates a link between memory and experience, which subtends the belief that cumulative experience can produce a kind of wisdom that comes only at the end of the day. Although by no means always the case, Erlebnis often suggests individual ineffability, whereas Erfahrung can have a more public, collective character. But we will see variants of each invoked in the opposite way. If the etymological evidence suggests anything, it is that "experience" is a term rife with sedimented meanings that can be actualized for a variety of different purposes and juxtaposed to a range of putative antonyms. As the German case shows, two distinct and competing variants of what in English is one term are even possible. It enables both the lamentation, which we encountered in the introduction, that "experience" (in one of the senses of Erfahrung) is no longer possible and the apparently contradictory claim that we now live in a veritable "experience society" (Erlebnisgesellschaft).5 It allows us both to "appeal" to experience, as if it were always a thing in the past, and to "hunger" for it, as if it were something that one might enjoy in the future. It permits a distinction between the noun "experience" as something that one can be said to "have" or "to have learned from" and the verb "to experience" or the process of "experiencing," the latter suggesting what one is now "doing" or "feeling." 6 Because it can encompass what is being experienced as well as the subjective process of experiencing it, the word can sometimes function as an umbrella term to overcome the epistemological split between subject and object; the American pragmatists were especially fond of using it in this way. If one adds the possibility of frequently employed adjectival modifiers, such as "lived," "inner," and "genuine," it is easy to understand why the term has had so lively a history and continues to exercise such a hold on our imagination. That history, it should be immediately emphasized, has not always been one of consistent celebration. In fact, in classical thought, it is frequently argued, what we now recognize as the antecedents of the term played a very modest, at times even negative, role. "In the Greek period," runs a typical account, "the notion did not exist much beyond the bare term empeiria, which occurs, for example, in the Metaphysics and Ethics of Aristotle as a kind of semantic seed for his commentators to develop. Perhaps following this lead, the notion of experience in the Latin period was confined to the action of the sensible thing making itself an object by its own action upon the organ of sense. "7 The neglect or even denigration of experience in classical thought is often connected to the hierarchical bias of the rationalist tradition that elevates ideas, intellect, and purity of form over the messiness and uncertainty of everyday life. Perhaps the most influential exponent of this characterization was the American philosopher John Dewey, who was anxious to ground his pragmatist alternative to idealist rationalism in a renewed respect for experience.8 According to Dewey, the classical denigration of experience prevailed until the seventeenth century and was based on contempt for the imperfections of mere opinion, as opposed to the certainties of science. Experience, reliant more on custom and habit than on rational explanations for the causes of things, was distrusted by Plato as an obstacle to true knowledge. He disliked it not because it was "subjective," a charge later leveled by modern defenders of a putatively "objective" science, but because it dealt with matters of chance and contingency. Experience meant for Plato and the tradition he engendered, so Dewey averred, "enslavement to the past, to custom. Experience was almost equivalent to established customs formed not by reason or under intelligent control but by repetition and blind rule of thumb. "9 At the opposite end of the spectrum were the necessary truths of mathematics, which were eternally valid, whether derived from the experience of a fallible subject or not. Although conceding that the Greeks were right to suspect the reliability of experience as they knew it—prior, that is, to the advent of experimental methods that could intersubjectively verify what had been experienced—Dewey claimed that the Greeks were wrong to pit reason against it as if the opposition were eternal and unbridgeable. Their fetish of universality, necessity, and abstraction meant that the classical philosophers had failed to understand the value of practical, if fallible, activity in the world, which Dewey set out to rescue. Whether Dewey's own account of experience was itself fully successful is an issue we will try to address in a later chapter. Whether his characterization of the Greeks was itself valid has been called into question by a variety of commentators. They have raised four major objections: First, it has been demonstrated that Greek science, especially such fields as medicine, optics, and acoustics, was not as a priori and hostile to empirical observation and even calculated experimentation as Dewey assumed.12 Filtered through later accounts by critics such as the Skeptics and early Christians, Greek science had been mischaracterized as based entirely on dubious thought-experiments, on syllogistic deductions, rather than on the sense-based results of empeiria. The same prejudice informed Francis Bacon's influential remarks on the subject, which were motivated in part by his hostility to the still potent effects of Aristotelian Scholasticism.13 But more recent research, combined with a dissolution of the rigid distinction between theory and empirical observation, has shown how problematic such sweeping generalizations really are. Second, it has been noted that literary evidence suggests a considerable popular reservation about the wisdom of purely "theoretical" man.14 Despite Plato's attempt to banish it from the state, the legacy of the Homeric epic—and has there ever been as vivid a depiction of the perilous Fahrt in Erfahrung as the Odyssey?—was never entirely forgotten. In the plays of Euripides and Aristophanes, the tradition of anti-empirical idealism identified by Dewey with Greek thought tout court was subjected to withering satire.15 Plato's notorious hostility to theatrical representation was earned in part by the resistance, presented on the stage, to his celebration of rational speculation. Finally, the value of experience within Greek philosophy itself has become more widely appreciated since the time of Dewey. In part this has meant acknowledging, as one recent observer has put it, that "philosophically, the notion of experience traces to Greek thought, especially to Aristotle. "18 Although Aristotle's final remarks in book 6 of his Nicomachean Ethics do denigrate phronesis in favor of theoria, elsewhere he notes that "the unproved assertions and opinions of experienced, old, and sagacious people deserve as much attention as those they support by proofs, for they grasp principles through experience. "19 Aristotle's brief, but seminal discussions of the scientific dependency on empeiria in the Metaphysics and Posterior Analytics recognize its links with memory and particularity,20 even if Aristotle himself was ultimately unable to break entirely with what has been called the "aristocratic" bias for universals and demonstrative logic inherited from Plato. A less equivocal appreciation of the significance of experience can be discerned among other ancient philosophers, most notably the Cynics and the Sophists. Diogenes' transgressive restitution of the body with all of its squalid needs and irreparable imperfections against the idealist celebration of the rational mind—his basely materialist reversal of the traditional hierarchy of values—implied an openness to what specific sensual experiences might teach.21 His famous lantern was directed at worldly sights encountered on a voyage of discovery, not at the eternal forms blazing in a Platonic firmament. So too, the Sophists' insistence on Man rather than Platonic Forms as the focus of philosophical inquiry meant that sense-experience had to be taken seriously as a vehicle of knowledge. According to Protagoras, "man is the master of all experiences, in regard to the 'phenomenality' of what is real and the 'non-phenomenality' of what is not real. "22 Although Gorgias concluded that experience, riven by contradictions, could never be reconciled with reason, other Sophists such as Antiphon sought to promulgate a more holistic understanding of the term, which would avoid irrationalist skepticism.23 The Sophists' stress on rhetoric against dialectic, logic, and mathematics meant that they were alert to the importance of oral as opposed to written language, language meant to persuade and influence an audience rather than demonstrate a truth, language for the ear and not the eye.24 In its performative mode, language was thus tied both to the theatricality decried by the Platonic tradition and to the intersubjectivity that was part of experience understood as an encounter with otherness. In one sense, to be sure, this search meant a tacit disdain for experience when it was identified solely with the accumulated wisdom of the past and thus considered a bulwark of traditional authority. In fact, according to Reinhart Koselleck, modernity (in German, Neuzeit) was first conscious of itself as a "new time"—he puts the change in the eighteenth century—when "expectations have distanced themselves from all previous experience. "38 That is, a spatial notion of past and present as simultaneously effective, with no privilege given to what is most recent or potentially to come, was replaced in modernity by a temporal alternative in which a horizon of expectation finds its legitimacy in an imagined future unbeholden to the past. The very historical sense that we associate with modern self-consciousness, in particular its belief in progress, is, Koselleck argues, dependent on the loss of faith in the seamless continuity of past with present and future. Although, as we will see when examining the politically conservative appeal to something called past "experience" in figures such as Edmund Burke, the rupture was not complete, at least one acceptation of the term—which identifies it entirely with learning from the "lessons" of the past—had now paradoxically acquired the pejorative meaning lingering from the classical period. Even so resolute a twentieth-century champion of Erfahrung as Walter Benjamin would have to work his way past that negative connotation in his effort to revive the term for radical purposes.39 But understood more in terms of a present reality than as a residue of the past and benefiting from the new appreciation of transience and ephemerality, "experience" did emerge at the threshold of modernity as at least a serious contender for the role abdicated by older and now discredited grounds of legitimacy. The changed attitude was evident in a number of different contexts. In religion, where the unity of the medieval church and its monopoly of doctrinal authority had been shattered, both the Reformation and the Counter-Reformation found in "experience" a possible resource in the struggle for souls. For many Protestants, what has been called the "affirmation of ordinary life"40 meant a new focus on the details of quotidian existence in the family or pious community rather than on the fidelity to doctrinal teachings or the rituals of the church. "Not scripture alone," Martin Luther insisted, "but experience also. . . . I have the matter itself and experience together with Scripture. . . . Experience alone makes a theologian. "41 The spiritual journey, that "pilgrim's progress" best exemplified in John Bunyan's celebrated parable, involved the perilous encounter with otherness and retrospective narration that were central aspects of the dialectical notion of experience. Although one's natural birth may not have been experienceable, a conversion crisis—being, in the now familiar metaphor, "born again"—certainly was. The immediacy of spiritual life, no longer filtered through the offices of an ecclesiastical hierarchy, produced a constant examination of behavior and motivations, grounded in the belief that, as the Pietist leader Count von Zinzendorf put it in 1732, "religion must be a matter which is able to be grasped through experience alone without any concepts. "42 The powerful tradition of a specifically "religious experience," which we will examine more closely in chapter 3, first emerged in this context. If among many Protestants, the evocation of "experience" could mean a democratic leveling of access to the holy, for certain figures in the Catholic Counter-Reformation, a very different implication might be drawn. Here the value of a specifically mystical variant of religiosity, which Thomas Aquinas had specifically defined as "cognitio dei experimentalis"43 (knowledge of God through experience), gained a new hearing. According to Gershom Scholem, the great historian of its Jewish variant, mysticism tends to appear at a stage of religious development when a prior unity between the sacred and the profane, between God and His world, is felt with particular keenness as a lost but potentially recapturable condition.44 Operating within traditional religions, rather than constituting radical attempts to create new ones, mysticism seeks to repair the rupture that it sees between the divine and the mundane. Although certainly antedating the Reformation—indeed, one might argue that the mystical quest for unity begins with the monotheistic separation of a transcendent God from His creation—it seems to have been given a new impetus by the crisis of medieval Christianity, as well as by social and political upheavals.45 Unlike the everyday vigilance against sin promoted by Protestant preachers as a practice for all to follow, mystical experience was reserved only for religious virtuosi, those with a special gift for ecstatic self-immolation or the discipline to focus intently the mind and emotions on only one goal, which has been called recollection.46 As the seventeenth-century French mystic Jean-Joseph Surin explained in his Science expérimentale, whereas "faith" is the commonplace path to salvation for the many, genuine mystical "experience" is only for "the few. "47 By the time of William Blake, however, the elitist implications of mysticism could be challenged and the hope expressed that all men might sing "songs of experience. "48 But whatever the possibilities for the realization of such a program, "experience" had gained a new connotation, as an especially intense and deep phenomenon that can even become an end in itself once its religious function is left behind. In the more humanist environment that produced the Renaissance, a comparable valorization of the exceptional individual, that self-fashioning uomo singolare or uomo unico whose importance has been recognized ever since Jakob Burckhardt,49 can be discerned. But here too a somewhat more egalitarian implication might ultimately be drawn from the new fascination with the singular subject. Perhaps the great exemplar of this new sensibility was Michel de Montaigne (1533-1592), who, despite his occasional placement within the Baroque era or even within a putative counter-Renaissance, typifies the Renaissance fascination with experience, now extended to commonplace people and mundane events. Insofar as his remarkable contribution to the discourse on experience has become a standard against which many others have been compared and often found wanting, it will be necessary to linger for a while in Montaigne's presence (a temptation to which it is easy to succumb because of the undiminished power of his remarkable oeuvre). Montaigne and Humanist Experience Montaigne's celebrated Essays significantly culminate with a long meditation written in 1587-88, when he was fifty-six, entitled "Of Experience." Having himself been an active participant in the affairs of his day—an aristocrat by birth, he served as magistrate for the Bordeaux parlement from 1557 to 1570—Montaigne had retired to his chateau in the Périgord for the last two decades of his life to ruminate on the humbling lessons he had learned.50 As he pointedly remarked, "on the loftiest throne in the world we are still sitting only on our own rump. "51 Although returning to public service for periods in the 1580s, he had the leisure to produce the most elaborate record of introspection—a kind of extended auto-interview, as one commentator has called it52—in the more than a millennium between Augustine's Confessions and those of Jean-Jacques Rousseau. Montaigne's Essays—their very title suggesting exploratory, tentative experiments rather than settled dogma—document his journey of self-discovery, as well as his extraordinarily keen observations about the human condition. Colloquial, idiosyncratic, accessible in style, they struggle to allow the personal voice of the author to emerge amid the alienated writing on his page. That voice is clearly in search of a sympathetic ear, such as the one Montaigne had lost with the death of his beloved friend Étienne de la Boètie in 1563.53 Confession in the traditional Christian sense of speaking through a priest to God will no longer suffice; Montaigne's imagined dialogue is with a worldly audience, which will recognize itself in his reflections. Here experiences are to be shared, not hoarded. Few words in both everyday parlance and theoretical discourse have been as rhapsodically defended or as fervently resisted as "experience." Yet, to date, there have been no comprehensive studies of how the concept of experience has evolved over time and why so many thinkers in so many different traditions have been compelled to understand it. Songs of Experience is a remarkable history of Western ideas about the nature of human experience written by one of our best-known intellectual historians. 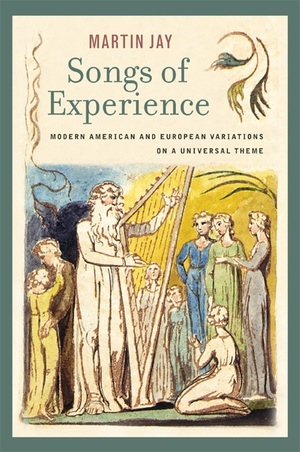 With its sweeping historical reach and lucid comparative analysis—qualities that have made Martin Jay's previous books so distinctive and so successful—Songs of Experience explores Western discourse from the sixteenth century to the present, asking why the concept of experience has been such a magnet for controversy. Resisting any single overarching narrative, Jay discovers themes and patterns that transcend individuals and particular schools of thought and illuminate the entire spectrum of intellectual history. As he explores the manifold contexts for understanding experience—epistemological, religious, aesthetic, political, and historical—Jay engages an exceptionally broad range of European and American traditions and thinkers from the American pragmatists and British Marxist humanists to the Frankfurt School and the French poststructuralists, and he delves into the thought of individual philosophers as well, including Montaigne, Bacon, Locke, Hume and Kant, Oakeshott, Collingwood, and Ankersmit. Provocative, engaging, erudite, this key work will be an essential source for anyone who joins the ongoing debate about the material, linguistic, cultural, and theoretical meaning of "experience" in modern cultures.